Is this Microsoft's next Lumia? The transition from Nokia to Microsoft may be complete, but the Lumia brand isn't going anywhere just yet. A new leak has appeared, reportedly showing the next handset in the Lumia line-up - called either the Lumia 1052 or Lumia 1030, depending on which source your read. It appears to be a follow up to the Nokia Lumia 1020 and sport an even more impressive camera. 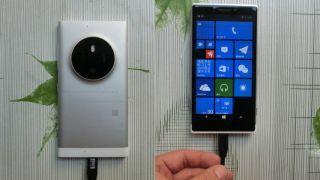 Unnamed sources put the camera on the new Lumia at 50MP, with a shutter-less design and a 4th generation short pulse LED flash. The body is set to get bigger to incorporate the camera upgrade, putting the screen size at 5 inches with a Full HD resolution. According to the leak, the chassis is crafted from aluminium apart from a small strip at the base. Like its Lumia bretheren, the Lumia 1052 or Lumia 1030 will run the latest version of Microsoft's Windows Phone OS. A report over at SlashGear contends that the handset could be Nokia's "McLaren" smartphone that was planned as a follow up to the Lumia 1020 last year. That device was rumoured to have a "3D Touch" interface that worked like the Microsoft Kinect, using air gestures as well as touch ones. Of course, this leaked image is likely to represent a prototype that could be refined and changed before a possible consumer release. Predictably, there's been no word from Microsoft on the authenticity of the image. All we've heard from the brand is a few comments back in September that they were continuing to work on a successor to the Lumia 1020. If we were betting types, we'd be willing to wager that Microsoft could have a new Lumia device ready for unveiling next year at MWC. Both in order to cement its ownership of the brand and push its operating system into contention for 2015. Meanwhile, does Nokia's PureView tech really make a difference?